After the death of Walt Disney in 1966, the animation studio that he created went into decline. While there is nothing wrong with Robin Hood or The Great Mouse Detective, the animated movies made in the 1970s and ‘80s just didn’t have the prestige or pizzazz of their predecessors. In 1989, The Little Mermaid reclaimed animation supremacy for Disney with cheery and expressive animation, catchy Broadway tunes, and the right mixture of humor and pathos for a kids’ movie. The filmmakers essentially retooled Disney’s fairy-tale-with-music formula. Although Mermaid is largely devoid of pop culture references that would turn up in later movies, it has a more modern feel, evidenced by the language patterns of the characters and the music video-style editing that accompanies the songs. The Little Mermaid establishes a formula that would be used successfully in subsequent Disney movies – a young person yearning for more from life; a love interest; a disapproving parental figure; some wacky sidekicks; a little adventure and peril; and of course, show tunes. The Little Mermaid is an adaptation of the Hans Christian Andersen tale with a Hollywood ending. 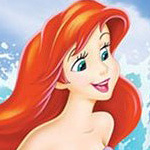 The yearning young person in this case is Ariel (voiced by Jodi Benson), a stunning redheaded mermaid, the youngest daughter of the king of the sea (Kenneth Mars). Much to his chagrin, she is fascinated with the world above and spends much of her time collecting human artifacts with the help of her friends, Flounder and Scuttle the seagull. She also has her eye on a human male, Prince Eric (Christopher Daniel Barnes), whom she rescues from a shipwreck. He remembers nothing about being pulled from the waves, except for the melodious voice of his rescuer. Meanwhile, Ariel, desperate to meet the object of her affection, makes a deal with the nasty sea witch, Ursula (Pat Carroll), who demands that Ariel give up her voice in exchange for a set of legs. The movie looks great, but it’s the music and lyrics by Alan Menken and the late Howard Ashman, that really make it soar. Ashman and Menken both came from a stage musical background (they collaborated on Little Shop of Horrors) and had no experience with animated films. The songs they created for this film feel both traditional and fresh. Under the Sea, Sebastian the crab’s relentlessly peppy calypso number, deservedly won the Oscar for best song. Kiss the Girl had made its way into popular culture as a love song, but I’m partial to Les Poissons, in which a French chef enthusiastically tries to dismember poor Sebastian. In recent years, Disney’s animation division has found itself at another crossroads. In 2004, Disney announced that the company would be abandoning traditional hand-drawn animation in favor of CGI (hoping to emulate the success of their subsidiary Pixar, no doubt). Unlike Pixar movies, Disney’s subsequent releases, Chicken Little and The Wild, have sacrificed character and plot development for pop culture references and punch lines. Fans of hand-drawn animation fans need not give up hope. A new 2-D animated film, The Frog Princess, is in development at Disney (greenlit by Pixar’s John Lasseter, according to a Wikipedia entry), and scheduled to be released in 2008. Whether they can recapture the old magic remains to be seen, but it’s encouraging to know that the some people still want to make these films, and have the power to get them made. Disney advertises this release as “first time on 2-disc platinum edition DVD.” In fact, the movie had been released on DVD in 1999, but without any extra features. This edition rights that wrong. The most interesting of the bonus features is Treasures Untold: The Making of The Little Mermaid, on the Backstage Disney section of disc two. In the 1930s, Disney had considered making The Little Mermaid as a short. Concept paintings had even been made, but the project was shelved. In the 1980s, the idea to adapt the story into a feature was initially rejected because a sequel to Splash was in development (in fact, one reason that Ariel was made a redhead was to avoid similarities with Daryl Hannah). This feature also highlights the contributions of Ashman and Menken. Ashman, who died in 1991, worked closely with the actors on their musical performances and contributed some dialogue to the movie. Continuing the behind-the-scenes look is Storm Warning: The Little Mermaid Special Effects Unit. The underwater and storm sequences required more special effects animation than other previous Disney movies. Unfortunately, this feature consists mostly of effects animators talking about how much they enjoyed working on the film, and tells very little about how the effects were done. The second disc also includes seven deleted scenes which include introductions by Ron Clements and John Musker, who wrote and directed the movie. Also worth watching on disc two is a seven-minute animated version of Hans Christian Andersen’s The Little Match Girl (without a Hollywood ending). Directed by Roger Allers (who co-wrote The Little Mermaid and directed The Lion King), this computer-generated film tells the story effectively and artfully, and needs no dialogue to do it. In the Games and Activities part of disc two is a section devoted to Under the Sea Adventure, a ride developed for Disney theme parks that was never built. There is a virtual theme park ride, as well as segments about the development of the project. This section of Disney DVDs is usually intended for children. I don’t know if kids would like this feature or not, but I lost interest once I found out that the ride had never seen the light of day. The only bonus feature of interest on disc one is a commentary track with Clements, Musker and Menken. They seem to enjoy talking about the movie and never run out of things to say. There are some interesting tidbits about the nuts and bolts of the production, as well as some trivia – continuity errors and a brief appearance by some well-known Disney characters. Some of what they talk about is duplicated in the behind-the-scenes featurette on disc two. Unless you are really interested in how Mermaid was made, this commentary is probably skippable. The back of the DVD box boasts that the film has been restored and has one before and after image as evidence. Some information on exactly what was done to the film might have been worthy of inclusion on the DVD, but there is no information to be found on either disc. Whatever was done to the movie, it looked and sounded great in our home theater. The disc offered the option of 5.1 Disney Enhanced Home Theater Surround Sound or Dolby Digital 5.1, and French and Spanish language tracks as well. Put in disc one and watch the movie. In fact, you might want to skip the main menu by using the Fastplay feature. Grownups should check out the “making-of” featurette on disc two (after watching the 83-minute movie, this 45-minute featurette isn’t too long). Animation buffs should look at the deleted scenes (the unfinished clips reveal the animation process) and galleries (which include art from both the 1930s and the 1989 versions). Finish with The Little Match Girl, a brand-new, artful, seven-minute cartoon, never before seen on DVD.